There is no ode to the pig more glorious than Carolina ’cue, and BSA Troop 33 keeps Carolinian culinary history alive each winter. 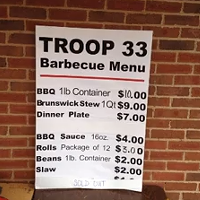 Barbecue as fundraiser is part of the culture and BSA Troop 33 (across the street from Sardis Presbyterian Church, 6100 Sardis Road) holds its annual event the Friday and Saturday before the Super Bowl. This ’cue is masterfully smoked over aged hickory.